Ideal for those looking for a more medium fitting snow goggle, the Crowbar offers a balanced fit thanks to struts. 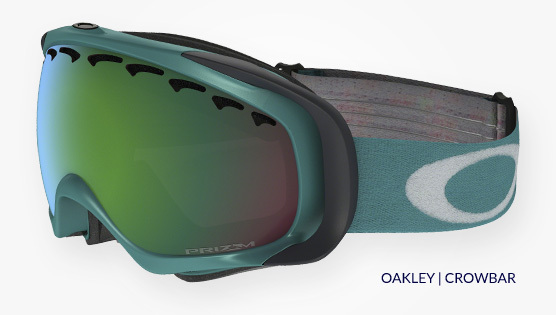 Oakley Crowbar snow goggle is ideal for medium size faces. It comes with triple layer fleece foam for brilliant moisture wicking & comfort and the flexible O-Matter material (Oakley's own material) conforms to your own face. Sturdy outriggers ensure a perfectly balanced fit, whether used on or off a helmet. The Crowbar snow goggles also feature an F3 Anti-fog treated lens and their High Definition Optic's patented system. You're going to look good up or down the slopes and confident in the capabilities of your chosen goggles as you go.